Out of all the tech gadgets and computer hardware I love to covering, computer cases ( or chassis for the technically correct) is probably the most interesting to write about. Mainly because computer cases today are becoming more fractal and compact in its design, with nice fancy RGB lighting and see through glass. That latest such PC case that have all ingredients on something special is Phanteks P400 and P400S, and yes it has RGB lighting and a see through window. Both these cases are exactly identical in design, with just a couple subtle differences which I will get to later, but overall basic construction, layout and features are vastly similar. Even though both these cases are mid-tower units it's spacious enough for users to install a E-ATX motherboard, a 395mm graphic card ( with a option 280mm hard drive cage) , CPU cooler up to 170mm, and ATX PSU's up to 270mm in length. Your power supply unit is seated nicely in its very own chamber that neatly hides all of your cables. In the very bottom of the case there is room to install two 3.5" HDD. You can include Four more hard drives to mount at the front of the main compartment, and two 2.5" SSDs which can actually be place right directly behind the motherboard tray. The cooling apparatus in the case features a 120mm and one rear exhaust fan. The front portion of the case can support up to three 120mm fans ( two 140mm fans), and the very top of the case has enough room for two 120mm or 140mm fans. Users will be able to fit 360mm and 280mm radiators in front of the case and a 120mm unit at the rear. There is no mention from Phanteks if users can place a radiator inside the PC case. Interestingly the front intake of the case has two dust filters, one place at the top, and the other on bottom. Most modern PC cases do have dust filters placed right underneath your PSU, but with Phanteks P400 and 400S users can easily slide the filter out for cleaning. More dust filters are added to the top exhaust which is something rarely seen in PC cases today. For me, the main attractive feature is the RGB lighting and front located I/O. The RGB lighting itself is a lit Phanteks logo located on the very bottom of the case, the LED lighting has 10 various colors. The I/O is located on the top front of the case which additionally has two USB 3.0 ports,the usual placed audio ports, and a power and reset switches combined with LED control. 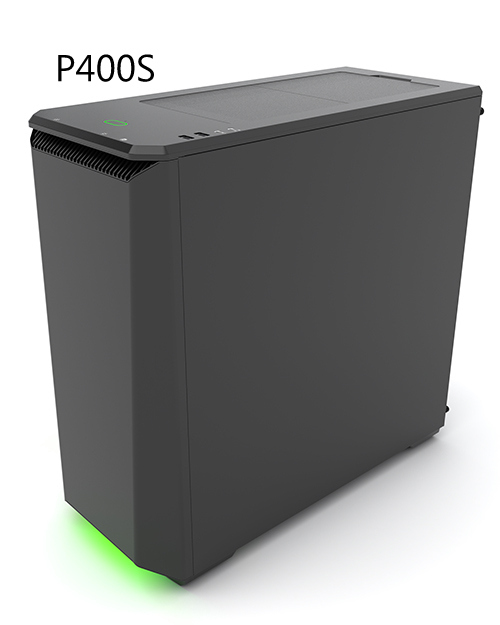 The P400S also comes with the three speed-fan controller which you'll usually see in most high-end computer cases, this is difference between the standard case which is the P400 and the S model. If you're wondering what the S stands for in the P400S model, S it simply means " silent". Along the side of the panels, you'll find noise dampening material. The very top of the case exhaust vents are closed off with special covers. The entire chassis and panel is constructed out of steel, with plastic bits placed on the top portion of the case. The measured dimension of the case is 8.3 in x 18.3 in x 18.5 in and weighs 17.6 pounds. In closing, the P400 will exist only as the windowed version, while the P400S with both sides window with a windowless side panel. Additionally, the case will come in three different color schemes, Satin Black, Glacier White and Anthracite Gray. Interestingly the prices are fairly reasonable, for the black or gray P400 sells for $69.99, and the white version has a $10 added cost at $79.99. As a $10 premium, the P400S gets the noise dampening materials. All cases will be available for market in March.